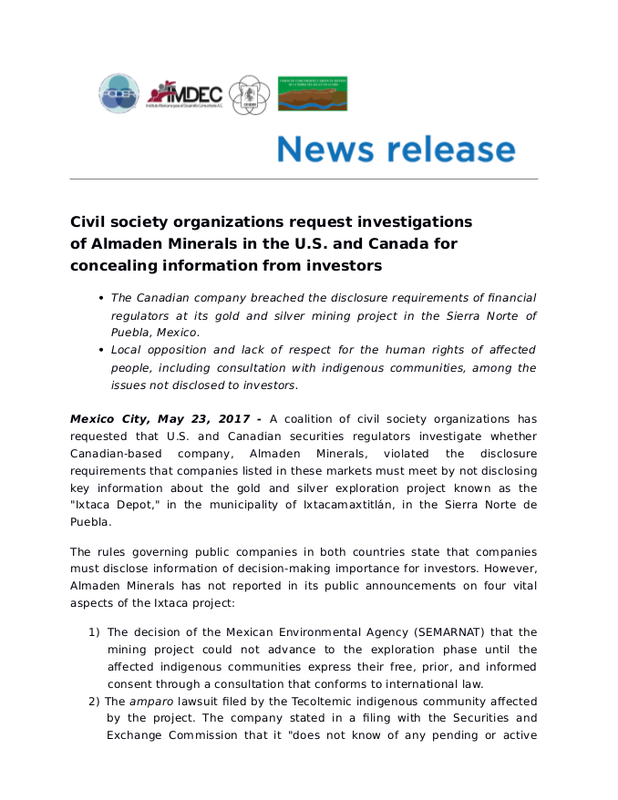 – The Canadian company breached the disclosure requirements of financial regulators at its gold and silver mining project in the Sierra Norte of Puebla, Mexico. – Local opposition and lack of respect for the human rights of affected people, including consultation with indigenous communities, among the issues not disclosed to investors. Almaden Minerals intends to process 7,500 tonnes of mineral per day at the Ixtaca site, which means that after 13 years of the mine’s life about 36 million tonnes of rock will be extracted to produce just 49 million ounces of gold and silver, leaving a mining pit of 1,000 meters of diameter and hundreds of meters of depth.